Gujarat and Himachal Pradesh Assembly election 2012 results will be declared on 20th Dec, 2012. Whole of country will watch these results because it will tell mood of general public in these states. These results will also tell how people are taking policies of center and state governments. In both these states, BJP has present governments; therefore, there is lot at stake for BJP. If BJP loses in any of these states then it will definitely become weak in national politics. On the other hand, it is test for Congress government at center to see whether people agree with its present economic policies or not. These elections will also tell that PM dreams of Gujarat CM Narendra Modi will see new light or not. In these elections, main fight is clearly between Congress and BJP because other parties do not have much presence in these states. In any election, ordinary people are actual heroes and they decide future of political parties and leaders through their votes. Counting of votes for Gujarat and Himachal Pradesh Election 2012 will start at 8 AM morning and within few minutes; we can expect trends of election results because EVMs are used for all constituencies in these elections. On this page, you can get complete and live update of results of both Gujarat and Himachal Pradesh Assembly election 2012. You will get multiple options to watch live results and updates of elections. All option will only appear few minutes before the start of vote counting on 20th Dec, 2012. So stay tuned and bookmark this page for all updates and live results of Gujarat Assembly Election 2012 and Himachal Pradesh Assembly Election 2012. Live Results Update of Gurjarat and Himachal Assembly Election 2012 will be updated below from 8 AM onwards tomorrow. Today Election Commission of India announced Himachal Pradesh Assembly Election 2012. As per announced schedule of Himachal Pradesh Assembly Election 2012, Himachal Pradesh Assembly Election will take place in single phase on 4th Nov, 2012. The result of this polling will be declared on 20th Dec, 2012 with Gujarat Assembly Election 2012 Results. The term of current Himachal Legislative Assembly is going to end on 10th Jan, 2013. Therefore, it was important for Election commission of India to conduct Himachal Pradesh Assembly Elections before these dates. There are total 68 assembly constituencies in Gujarat and out of which 17 reserved for SC and 3 reserved for ST. The total numbers of electors in Gujarat are 4516054. Photo electoral rolls will be used in this election and Himachal Pradesh is one of Indian states which has 100% photo Electoral rolls. Electronic Voting Machines (EVMs) will be used in this election. To conduct Himachal Assembly Election in fair way, there will 7252 polling station spread across Himachal Pradesh? All critical events of Himachal Election will be video filmed to make this election free and fair. Voter Slips will be distributed to all enrolled voters by the District Election Officer. Any person can use toll free number 1950 for any complaint registration regarding Himachal Pradesh Assembly Election 2012. Below you can find complete detail and information on Himachal Pradesh Assembly election 2012. Finally, Today Election Commission of India announced Gujarat Assembly Election 2012 dates and schedule. As per announced Gujarat Assembly Election 2012 schedule, Gujarat Election will take place in two phases on 13th Dec, 2012 and 17th Dec, 2012. 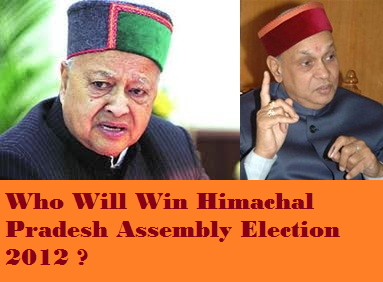 The results of both the phase will be declared on 20th Dec, 2012 with Himachal Pradesh Assembly Election 2012 Results. The term of current Legislative Assembly is going to end on 17th Jan, 2013. Therefore, it was important for Election commission of India to conduct Gujarat Assembly Elections before these dates. There are total 182 assembly constituencies in Gujarat and out of which 13 reserved for SC and 27 reserved for ST. In first phase, 87 assembly constituencies will go for polling and in second phase, 95 assembly constituencies will go for polling. The total numbers of electors in Gujarat are 37815306. Photo electoral rolls will be used in this election. Electronic Voting Machines (EVMs) will be used to conduct this election. To conduct Gujarat Assembly Election in fair way, there will 44496 polling station spread across Gujarat. As just final few months left for Gujarat Assembly Election 2012, political temperature of Gujarat in on rise. Eye of whole of Indian media is on Gujarat because everyone wants to see that Gujarat CM Narendra Modi can make it to Gujarat Assembly for third time or not. Gujarat is in rule of BJP government from last 15 years with three consecutive wins in Assembly election out of these three wins BJP got two wins under the leadership of Narinder Modi. In last two assembly elections, BJP has won almost two third majority in state assembly which shows great hold of Modi on Gujarat voters. This time also he is confidence of repeating same story and presently, he is busy in traveling around Gujarat to tell achievements of his government and failures of central government. In earlier article - Who will win Gujarat Assembly Election 2012 ? Opinion Poll I gave some picture of different possibilities in Gujarat Assembly Election 2012. The biggest advantage with Narendra Modi is weak opposition. Despite all claims by Congress and recently created new party Gujarat Parivartan Party by former BJP CM Keshubhai Patel, it looks unlikely that they will be able to hit hard at Modi. Recent price hike and corruption issues against congress are likely to favor BJP in Gujarat Election; though opposition is also blaming Modi for corruption charges; however, they lack strong evidences. On the other hand, Narendra Modi looks to be targeting central government with his speech and attacks. Though, some political adversaries of Modi points all this as Modi’s overconfidence. The biggest advantage in favor of Modi is strong discipline in Gujarat BJP which provides him great advantage. Moreover, Narendra Modi is one of favorite candidate for PM post in India as pointed by many surveys. Shortly, Election commission will announce dates of Gujarat Assembly Election 2012 and with this Gujarat Election battle will start once again. What will be the actual results of Gujarat Assemble Eelction 2012 that we will only come to know after the end of these elections; however, one thing is clear that these elections are going to be one of biggest election’s of 2012. By the end of this, assembly election in the state of Himachal Pradesh will take place. These elections are likely to be held in the month of November and December. There are total of 68 assembly seats in Himachal Pradesh and any party needs to win 35 assembly seats to make a new government in Himachal. The main fight in Himachal Pradesh is between Bharatiya Janata Party (BJP) and Congress; though, we can see some presence of parties like Bahujan Samaj Party (BSP). At present, BJP government is ruling state which it snatched from Congress in 2007 after getting a landslide victory. In 2007 Himachal Pradesh Assembly election, BJP got landslide victory by winning 41 assembly seats out of total 68 assembly seats whereas Congress succeeded in getting 23 seats only. Bahujan Samaj Party (BSP) also succeeded in getting its first assembly seat in Himachal Pradesh during 2007 election. In 2007 Himachal Pradesh assembly election for first time BJP succeeded in getting a landslide victory in state. Now major question in front of us is that will BJP be successful again in repeating 2007 success or Congress will take advantage of anti-incumbency factor? At present, it is hard to predict a clear picture because there are many negative points against both parties. Congress’s likely Chief Minister candidate Virbhadra Singh is facing corruption charges and there is negative sentiment against congress central government. On the other hand, BJP is facing internal fight between its top BJP leaders of Himachal Pradesh. If we calculate on all parameters then fight looks equal between BJP and Congress; though anti-incumbency likely to help Congress. In near future, it will become clear to us that which party has edge over other as political fever will increase in state. We can easily see Himachal government ministers and MLAs rushing to their constituencies to vow voters. However, one thing which is against BJP is clear visibility of anti-incumbency factor on ground which will decrease its numbers of seats considerably, Though, final results will depend on all factors together. Finally, India is again ready to choose its next President. Present President of India is Pratibha Patil since 25th July, 2007 and she is 12th President of India. Election Commission of India has announced dates of Presidential Election scheduled in the months of June and July, 2012 to elect new President of India. So far, there is no consensus on the name of next President of India; though we can soon hope for announcement in this regard. Both ruling alliance and opposition are silent on names of their presidential candidates and they are consulting their allies to announce their candidates. Number strength is in the hands of ruling UPA; therefore, next likely President will be a UPA candidate. Below, you can check complete details with dates of schedule of Presidential Election 2012 India. At the end of this year, Indian state of Gujarat is going for next Assembly Election. Gujarat Assembly Election 2012 is likely to take place in the month of November or December. Today, Gujarat is one of the fastest developing states of India and it is ruled by Bhartiya Janta Party (BJP) from last fifteen years. Out of these 15 years of BJP rule in Gujarat, Narendra Modi has remained chief minister of state for more than 11 years and he is also current CM of Gujarat (Holds record for longest tenure). In Gujarat, main election battle is between BJP and Congress. There are total of 182 assembly seats in Gujarat Assembly; therefore, any party needs to win more than 92 seats to make next government in state. Now biggest question in front of us is that will BJP and Narendra Modi continue their victory race or will Congress stop them? These elections are one of the biggest and significant elections because results of this election will influence state politics. Therefore, everyone has full eye on these elections. If Narendra Modi and BJP repeated their past success then BJP and Narendra Modi will emerge stronger at national politics. This win can help Narinder Modi in fulfilling his dream of becoming Prime Minister of India or otherwise, it will ruin his dream. Though at this level, we are required to wait for few more months to see what is stored in future. In 2007 assembly election, Congress was very hopeful of winning Gujarat Assembly election; however, it won only 62 seats out of total 182 seats. While Narendra Modi led BJP won 117 seats and got comfortable majority in state. 2007 Gujarat Assembly election results clearly indicated that people of Gujarat appreciated Narendra Modi’s policies as CM of Gujarat. If we go by present trend then Narendra Modi looks very strong in state; however, Congress party can surprise him at certain place. Overall, we can give a good edge to Narendra Modi in this election because Congress looks weak in state; however, this trend can change in coming months as election date will come close. Here find updated list of all successful and leading candidates in Punjab Assembly Election. At present, this list is updating and final list will be available by evening. Tomorrow 8 AM onwards, we will start getting trends and results for all 403 assembly seats in UP. By afternoon, it will almost become clear that who will make next government in UP. Will people of UP say goodbye to Mayawati government? Will Samajwadi Party emerge biggest party in UP? How much success Congress will get in UP? Will BJP surprise us? Today, we only have long list of questions and we will get answer to these questions tomorrow. This is my last post on exit poll results on UP. So far, I have gone through dozen of exit polls related to UP and all these polls are pointing towards edge for Samajwadi Party (SP) in UP. Some polls and exit polls are even pointing towards absolute majority for SP; though, one thing is clear that SP is very likely to emerge as single largest political party in UP. Therefore, there are good chances that SP will make next government in UP. Though, it is not right to totally write off other political parties because tomorrow results can surprise any one. Second point which all exit polls are pointing is massive loss of seats for BSP as per these estimates BSP can loss 60 to 140 seats. If this happened then it will clearly show that people of UP didn’t liked 5 year long rule of BSP in state. Third point which all exit polls are pointing is no or very less improvement for BJP and Congress. This news may surprise top leadership of BJP and Congress. At end, we are required to wait for some hours to see ourselves what people of UP think.